Gathering competitive intelligence is an excellent strategy for e-commerce merchants. Knowing what your competitors are doing allows entrepreneurs to make decisions to keep current customers and to attract new ones. 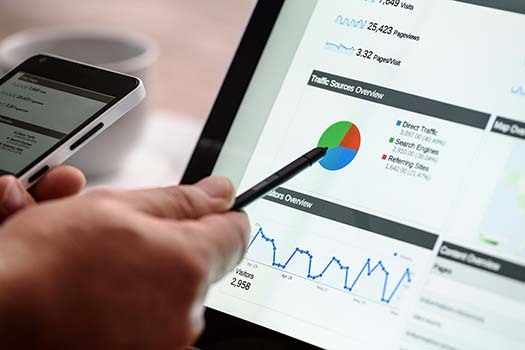 In this article we discuss tools, to help your research your competition in order to determine their strengths and weaknesses. To get started we have to identify our top competitors for a specific industry. The most straightforward way to do this is to use Google keywords in order to determine, which competitors rank the highest on Google for a specific industry. To obtain unbiased search results, search for competitors in incognito mode. Note the first five or all competitors on the first page of the Google search results. If your company has a URL or domain, then another method to obtain related competitors for your business is to search using the following term, “related: www.yourcompanydomain.com”. In this care “yourcompanydomain”, is the registered domain for your business. What advantages do your compettiors have over you? What are the prices for their products compared to you? What is the quality of their videos and photographs? Are they using call to action buttons? Are they building an email list? What is their social media strategy? Alexa allows entrepreneurs to analyse statistics, analytics and website traffic of competitors. Alexa returns results for global traffic rank, inbound links, on page search engine optimisation, website load times and much more. There are some inaccuracies in Alexa’s results, but they do allow the formulation of a general overview of competitors. Google AdWords Keyword Planner is a keyword research tool allowing you to find the right keywords for ads. This tool allows users to easily analyse keywords thereby obtain related keywords and traffic generated for these keywords. The tool allows detailed searches by including URLS and categories in keyword searches. The keyword further allows entrepreneurs to determine how much competitors are paying Google per click on their ads. This is a webpage comparison tool. This tool allows entrepreneurs to compare pag etitles, meta information and phrases occurring on different pages. Internet Archive is a non-profit library of many website. Making use of the Internet Archive’s Wayback Machine, users can obtain snapshots of what a website looked like through the years. This historic snapshots allow entrepreneurs to obtain a historic perspective into the strategies and operations of their competitors. Who is a query and response protocol that is used to query databases storing registered users of an internet resource such as domain name or an IP address. Entering your competitor’s URL in WHOIS returns a detailed record of that domain including: server stats, registrant’s contact details, links to the domain as well as other domain owned by the registrant. SpyFu exposes the search marketing secret formula of your most successful competitors. SpyFU allows entrepreneurs to search for competitor’s domains and view where these competitors have shown up on Google. This tool allows entrepreneurs to see every keyword bought on AdWords, every organic rank or ad variation used by a competitor in he last 11 years. SpyFU allows searches for competitors. SpyFU shows all keywords bought by competitors and the ads that they ran. This tool allow entrepreneurs to study the successes and failures of their competitors. Google Alerts allow entrepreneurs to receive email alerts when new results for a topic show up in Google Search. When setup for your store name, and the names of your competitors, then this free service allows you to receive alerts for key industry terms. This allows entrepreneurs to monitor the market for new developments. Having obtained sufficient information about your competitors, try to take advantage of their weaknesses. Improving on weakness enables entrepreneurs to remain competitive and profitable.